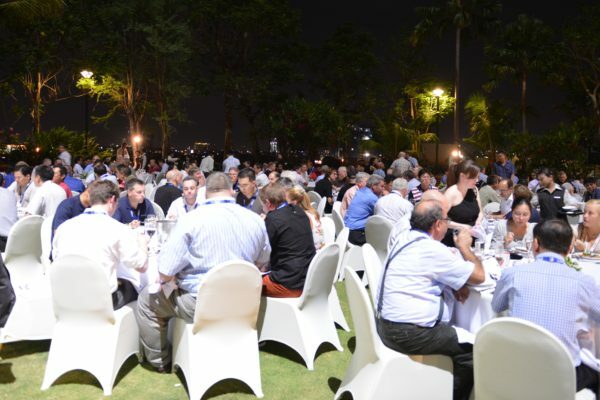 With over 110 can makers in attendance, exhibitors and delegates alike reported that the event, held at the Marriott hotel in Surabaya, Indonesia, was extremely valuable. The top-level keynote speakers delivered constructive insight into the current state of the can making industry. From the delegate feedback sheets, all participants were very satisfied or satisfied with the quality of the speakers and believed content was appropriate and informative. 97 per cent believed that staff were professional, helpful and courteous and 100 per cent would recommend Asia CanTech to others. The only delegates noting they won’t be attending next year quoted reasons such as ‘only focused on domestic market’ or ‘retirement from the industry’. 97 per cent rated the event good, very good or excellent compared to others in the industry, with 70 per cent noting very good or excellent. The event in 2014 will take place in Bangkok 27-29 October. It is already proving popular with more than half of the presentation slots booked. Hiroshi Ueno, general manager of marketing at Universal Can, spoke about the aluminium bottle market in Japan and Asia. He noted that the aluminium bottles have a good top-note, enabling customers to smell through the nose while drinking. The inner pressure releases gas with its aroma when opening. Finally, the aluminium bottle (ALB) has a good barrier against light and oxygen, which gives a better shelf-life and is light weight and highly recyclable. Ueno gave an overview of the metal bottle market for beverages. In Japan, the quantity filled in 2012 was 2,291 million, which is a 102 per cent increase on 2011. The primary products include black or milk coffee, tea and juice. The second largest market is the US where 700 million bottle cans were filled in 2012. This was an increase of 290 per cent on 2011, primarily for the beer and energy drinks markets. South Korea is also prominent with 104 million, an increase of 114 per cent, for coffee and tea products. Christof Frohs from Ibea spoke about in-line colour monitoring for two-piece cans and printed metal sheets. Ibea’s pattern checker has a speed of up to 9,000 sheets per hour with black/white and colour line scan cameras with up to 8.000 pixels. Computer to Film. Due to diffusion of light (in transparent part of the film + due to exposing), the printing elements have a wide base. Reversed elements tend to clog up. In print heavy beaded edges appear. Due to dotgain, the smallest dot on the plate (one per cent) show in print a minimum of 12 per cent. Computer to Plate. Due to diffusion of light (due to exposing), the printing elements have still a wide base (less as CTF) Reversed elements tend to clog up. In print beaded edges appear. Due to dotgain, the smallest dot on the plate (one per cent) show in print a minimum of eight per cent. DLX. Only little diffusion of light ensures a stable base but, steep base. Reversed elements stay open better. In print beaded edges are, close to, not there. Due to dotgain, the smallest dot on the plate (one per cent) show in print a minimum of four per cent. Direct Laser Engraving. Due to no UV-exposing, the image can be shaped optimal for every customer / decorator. This way reversed elements are optimal, no beaded edges appear and dotgain can be eliminated (dots below one per cent in print are standard). “What makes the DLX different to other CTP systems? It is more compact, complete (RIP-system, Inline UV and HD standard) and is developed out of the demands from dry offset plate makers, printers and production managers,” concluded Geffers.